The cover of the 1973 paperback edition, as the drivel became a blockbuster. 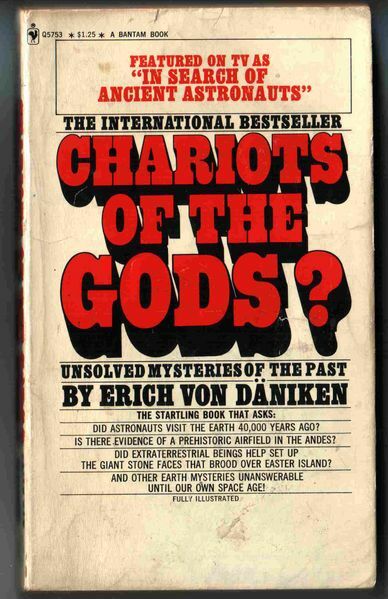 I posted a bit of a ramble about how I first encountered the book Chariots of the Gods? back in 1971 and how by 1972 the book had infected the collective consciousness enough that multiple evangelical pastors were feeling the need to preach sermons against it. The first U.S. paperback edition was published either just before or during my fourth grade in elementary school. At that point, in the U.S., the book had not yet become a bestseller. So the ancient alien ideas, and specific references to Erich von Däniken’s hack history theories about how aliens had influenced the course of human history were just trickling into my life. My dad had been promoted and we had moved back to the town where my grandparents lived, becoming members of the Southern Baptist Church there, again. A documentary based on Chariots of the Gods had been dubbed into English with Rod Serling narrating and was released as a theatrical film. Not realizing that In Search of Ancient Astronauts was from the same book I had already been skeptical of, and since a friend wanted to go see it in the little theatre in town, I went. Based on conversations at school the next week, at least half the kids in town saw it during the three days it was playing. A quick digression: the movie theatre in that small town played all movies on a very strict schedule: one movie would come to town and play Monday through Wednesday. Another movie would play Thursday through Sunday. No matter how sold out a movie was, it would not be held over. And because we were such a small town, there was only one movie distributor that would send movies our way, and they gave the theatre a limited set of choices. There was also apparently always some movies that were flagged by the distributor as mandatory each month. Anyway, suddenly everyone at school was talking about the figures drawn on South American plains, and the stone faces on Easter Island, and all kinds of absolute poppycock about pyramids and ancient Eqypt. Our local pastor wound up talking a bit about the movie in a sermon, though he stuck to a rather simple refutation of the more outrageous historical inaccuracies. Our pastor leaned toward the theological school that god didn’t perform vast spectacular showy miracles willy nilly, because doing that all the time would negate the need to have faith. So he didn’t spend a lot of time trying to replace von Däniken’s aliens with angels and acts of god. Then, the documentary was broadcast on network television. I also understand that it was circulated to a lot of schools, as well. The new paperback edition became a best-seller. For our next revival week the church brought in a guy whose schtick was chalk drawings. He would give a sermon as a story, and while he talked, he had a big pad of paper on an easel and he sketched out in chalk some sort of landscape scene which was related to the story in some way. Then, he would reach the dramatic climax of the story, make some clichéd comment about Jesus, and with a flourish turn on a black light that was part of the easel, which would reveal a shining cross in the middle of the sky, or maybe transform the idyllic pond and hillside into the hill of Calvary with all three crosses on it, or some other religious symbol. It was a clever schtick, because the first time you’re mildly curious about what he’s drawing and listening to the story, then genuinely surprised at the reveal. During all the subsequent evenings, you’re watching much more closely because you’re trying to see when he’s drawing the symbols you can’t see until the black light is turned on. It became quite a thing in evangelical circles in subsequent years: Christian bookstores started selling Chalk-Talk Kits that were a bit of a cheat. The phosphorescent image was already printed on the paper in ink that, in ordinary light, was the same color as the paper. You could draw just about anything on the sheet with the chalk, then shine the black light on it and see an image of a cross, or some scene from a Biblical story. But to get back to the revival pastor, he made more than one shot at refuting Chariots of the Gods. In one of the sermons debunking von Däniken, the chalk drawing transformed into an image of Jacob’s Ladder. Another which was about Ezekiel’s wheel-within-a-wheel vision that revealed a very ordinary looking angel that bore no resemblance to the vision described in the Bible. The next year we got the guy and three singing women as are revival act, and they had two different songs as well as a sermon. I admit, one of the songs, which was about how the devil could make some people believe the most foolish things, was pretty funny. Then that summer most of the kids my age (I was about to turn 14 at the time) from our church were sent off the Bible Camp. Bible Camp was a hybrid of Vacation Bible School and summer camp. Mostly middle-school-aged kids would go off to a bunch of cabins in the wilderness. We were supervised by some adults from each church that sent a bunch of kids, and a bunch of camp counsellors who were often only slightly older teen-agers. We’d gone to this camp the previous summer, and it hadn’t been a horrible ordeal. Each of the years we went, the camp had a guest evangelist who gave sermons twice a day throughout the camp. That year we had a guy who was very unusual for a Southern Baptist minister in 1974. He wore his hair long. Not as long as most of us guys wanted to grow our hair, because of course wholesome Baptist boys couldn’t have long hair, but it was long enough to hide his ears, which I think would have been considered scandalous back home. He was young and flamboyant and he wore unusual clothes. The first day he was wearing a fairly typical dark blue suit jacket, matching slacks, and a lighter blue tie. By the second day of camp he had a three-piece charcoal grey suit with a blood-red shirt and black tie. And the suits just kept getting wilder all week, culminating in yes, a lime-green three-piece pin-stripe suit with a bright green tie and an almost pastel green shirt. His daytime sermons throughout the week had been about various kinds of temptation we faced in the world, which was a fairly common theme whenever any service was aimed at teen-agers and kids in Baptist settings. The primary difference was that he tried to play the cool card. Whereas a lot of evangelicals railed about the evils of rock music, he focused more on staying away from music with unwholesome lyrics, but uplifting pop music, he said, was perfectly fine. Lime-green suit day was when he talked about Chariots of the Gods, and was it a doozy. I don’t remember a lot of his specific points, but I recall that he spent an incredible amount of time quoting specific passages from von Däniken’s book—always being sure to mention which page he was quoting from—and then he would pick it apart, with a lot of snarky commentary about just how stupid someone would have to be to believe in aliens at all, let alone aliens coming to Earth and teaching people how to build pyramids with secret anti-gravity technology that we subsequently forgot how to use. No! It couldn’t be aliens! It was clearly demons trying to distract us from god’s message, or it was angels trying to save us from demons. That was a much more common sensical explanation, right? One more thing about lime-green-suit-guy, in the dining hall after the day service, any time a camper commented on the suit, he’d grin and say, “I call it my sherbet suit!” and he would stick his arm out toward one of the guys standing by and ask, “Don’t you just want to lick it?” At the time, I just thought it was an attempt at a joke. It was only years later, once I’d finally admitted to myself that I wasn’t just being tempted by guys, but queer was something I was, that I realized that that pastor exhibited a lot of traits of a badly closeted gay man. Similarly, listening to the lengths that some of the evangelists went to point out how ridiculous the notion of ancient astronauts influencing human culture was, while talking about equally implausible and contradictory Bible stories just put a more cracks in the already crumbling foundations of my willingness to embrace the evangelical faith I’d been raised in. Because if you set the most ridiculous passages of the Bible next to the most ridiculous in Chariots of the Gods?, it’s hard to say which is less plausible.